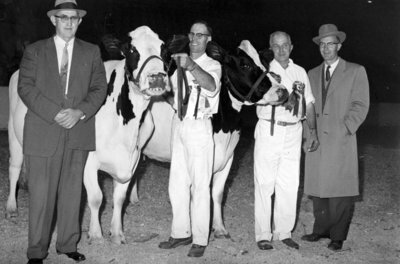 A black and white photograph of Roy Ormiston with the Grand Champion Female Holstein in Peterborough. This picture was taken at the 18th Annual East Central Ontario Championship Holstein Show in Peterborough. Left to right: Hardy Shore; Roy Ormiston; Harold Jebson; George R. McLaughlin. Hardy Shore was a judge at the show. Roy Ormiston, of Roybrook Farms, Brooklin, is holding the Grand Champion Female, Balsam Brae Pluto Sovereign. Harold Jebson is holding the Reserve Grand Champion Female. George R. McLaughlin, of Dunrobin and Elmcroft Farms, Beaverton is the owner of the cow held by Harold Jebson. This picture was printed in The Oshawa Times, October 21, 1959. Roy Ormiston, October 1959, Jim Rose. Whitby Archives 25-000-347.